Can’t wait for sun-soaked spring cycling? You don’t necessarily have to. 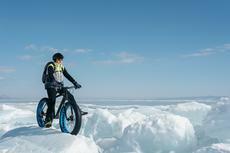 Give fat biking a shot. The wide-tires tackle snow and give the rider a great workout. It has become increasingly popular and there are more places to ride than ever before. For those who already love cycling, fat bikes can help extend your riding season well into the snowy months, whether you choose to bike commute or hit the trails. The fat bike phenomenon has taken hold in the past few years, prompting seasonal cyclists to make the switch and ride year-round. The Wyoming wilderness offers some of the best opportunities for the adventurous sport – a crazy winter adventure you should try. Designed specifically for handling soft, uneven conditions, the fat bike, which is really built for exploration, is perfect for taking on snow, sand, and even some dirt trails where you might need extra grip. The defining features on these bikes are the over-sized tires – about 3.7-4.8 inches on 50-100mm-wide rims. The tires allow the rubber to float over obstacles or unfavorable conditions—and they are a blast to ride any time of the year. They can be used with inflation pressures as low as 4 or 5 psi, though a common psi reading is closer to 8 to 10 psi, depending on conditions. Fat bike riders adjust the psi based on the conditions for the perfect ride—soft snow means a lower psi and hardpack means a higher psi. For comparison, regular mountain bike tires usually hover around 30-50 psi. The following list, on which bikes are listed in no particular order, is based on reviews by Outside Online, Mountain Bike Guide, and Gear Patrol.